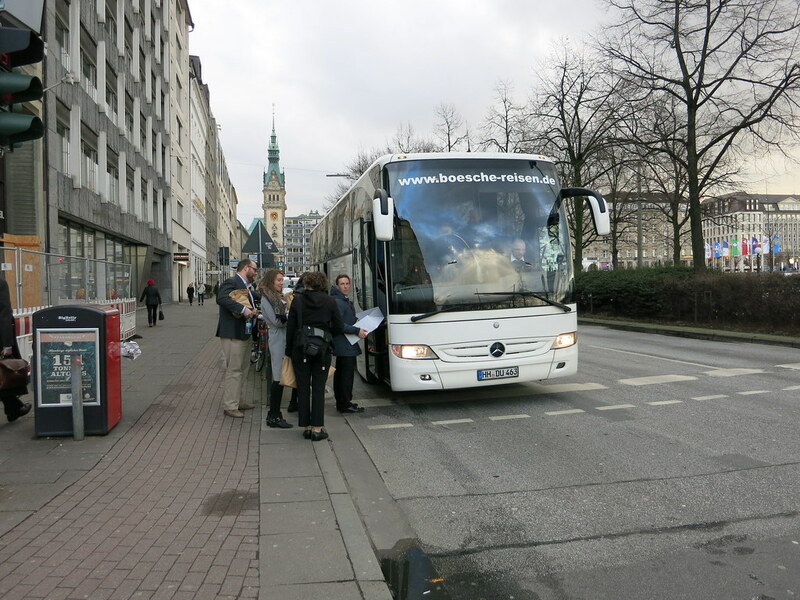 After a boat trip through Hamburg’s imposing Speicherstadt and a short visit to the magnificent Elbphilharmonie, Hamburg’s newest landmark, the Expedition headed – through typical Hamburg weather – to the venue of the second session of the day: the illustrious headquarters of M.M.Warburg & CO, one of Germany’s few remaining privately-held banking institutions founded in 1798. 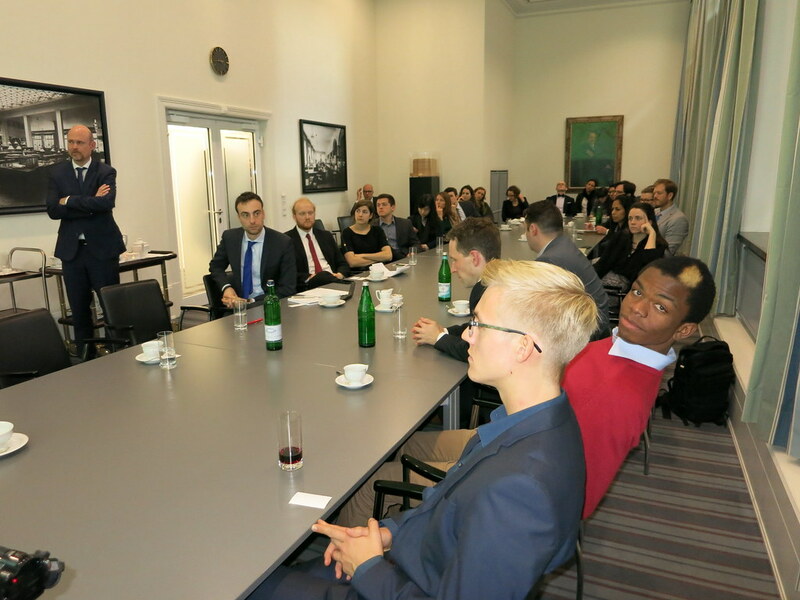 The fellows were received by Dr. Henneke Lütgerath, one of the bank’s four partners, and Dr. Christian Jasperneite, the bank’s Chief Investment Officer. 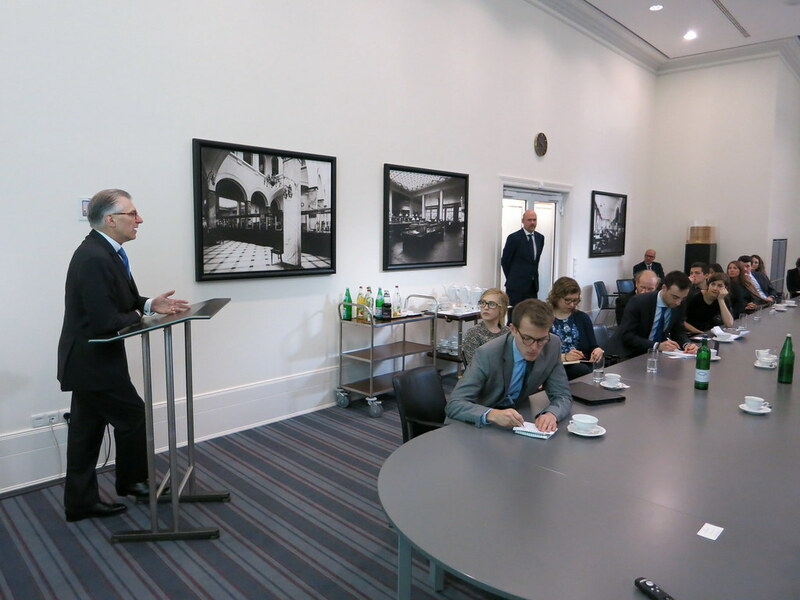 Dr. Lütgerath began his introductory remarks with a short overview over the bank’s history specifically pointing out its own transatlantic interlude. In 1938 Max M. Warburg, the bank’s chief partner at the time, had to emigrate to New York City, as the family’s bank holdings were confiscated by the Nazis. It was not until 1949 that his son Eric M. Warburg, an officer in the U.S. Army, was able to reestablish the Warburg family as shareholders of the (renamed) institution. This past still serves to explain the bank’s extraordinary commitment to the transatlantic relationship. Dr. Lütgerath then went on to provide a short description of Germany’s quite unique three-pillared banking system (made up of private, public, and cooperative banking institutions), M.M.Warburg & CO’s position as a “strange animal in the business” and the increasing regulatory complexity facing the bank. 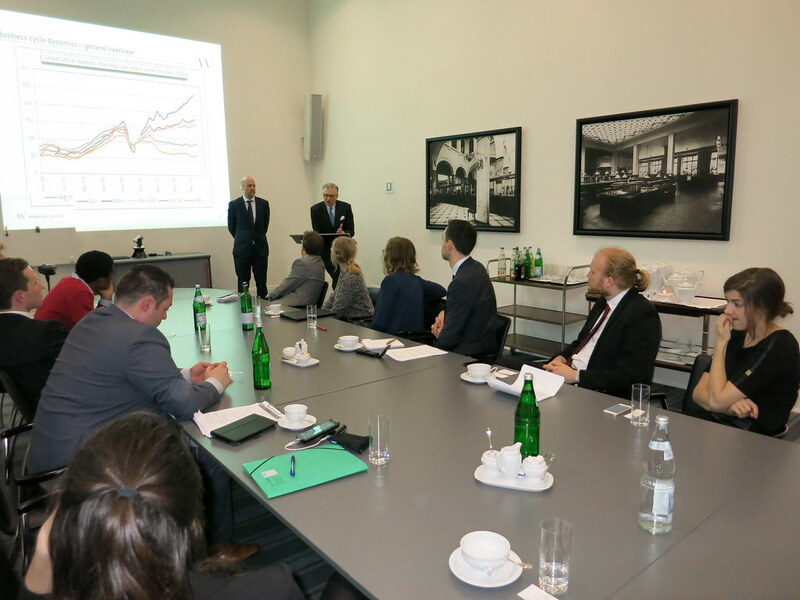 An economist by training, Dr. Jasperneite continued by presenting a wealth of business cycle data and indicators on the economic outlook for both Germany and Europe as a whole for 2017. 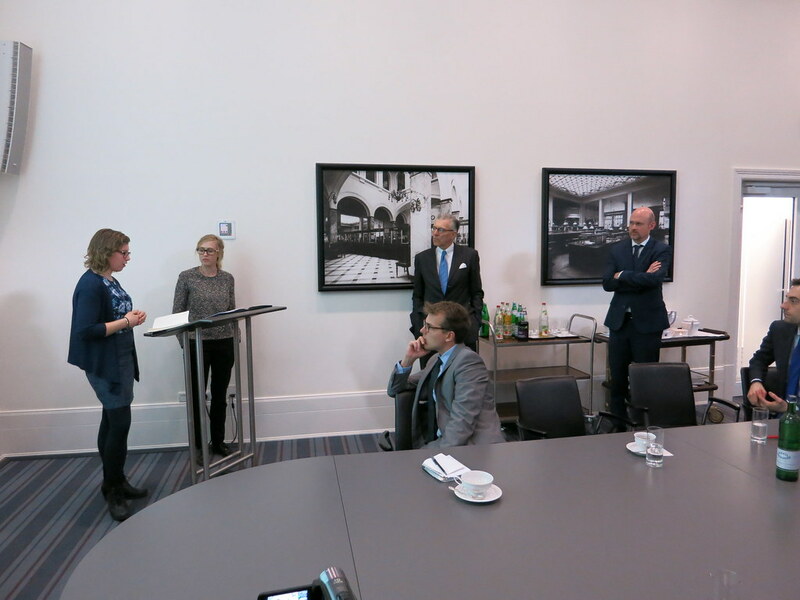 After a first brief Q&A came the time for the fellows to present their memorandums, three in total in this particularly productive and engaging session. The economics working group went first. 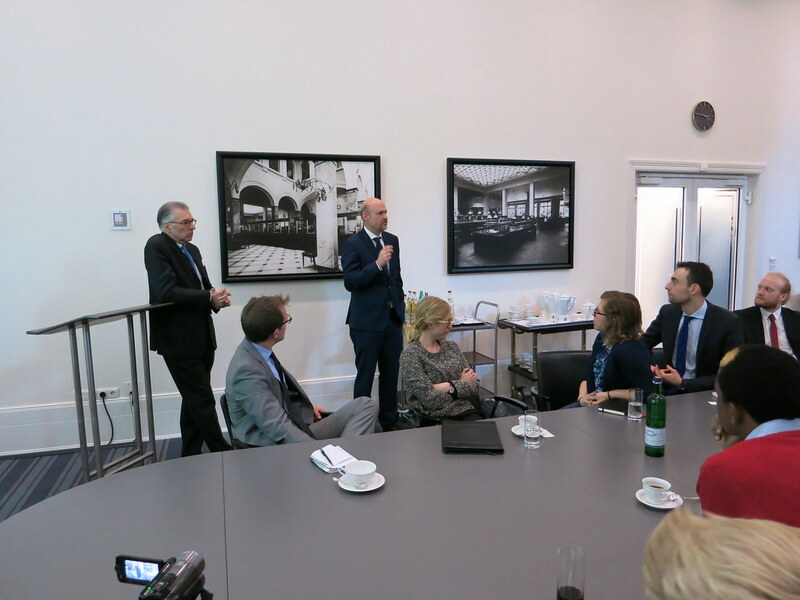 The insightful discussion soon focused on trade and the backlash against TTIP. Dr. Jasperneite, a staunch advocate of free trade agreements, reasoned that the current stalemate over TTIP should not be exaggerated in importance, but that it was critical that a broader perspective of a free trade agreement between the U.S. and the EU was not abandoned, even if the process might take a few additional years. He also pointed out that German exports grow fastest with countries that still have high tariffs. Labelling the negotiation process “a tragedy”, Dr. Lütgerath, in turn, decried that the negotiating parties and other pro-trade voices had not taken the shift in the public debate serious enough. The recommendations of the climate change working group, which were presented next, were similarly debated in depth. With regard to knowledge sharing, Dr. Jasperneite raised a concern that this might be difficult to achieve on the company level as companies might understandably be hesitant to share their intellectual property. Dr. Lütgerath, moreover, questioned whether Germany should indeed be considered a role model, as the German experience was itself fraught with economic misallocation due to an oversubsidization of the green sector. A discussion of the tech memo, and its proposal of establishing sister tech cities, served as the grand finale of the session. Sympathetic to the idea of sister tech cities, Dr. Jasperneite cautioned that testing is always more reliable when done in a real, rather than a totally artificial environment. In his opinion, it would therefore be crucial that, notwithstanding their special status, the cities could still be seen as representative of the market at large. Furthermore, test cities might not be suitable for trial runs of all products. Dr. Lütgerath concluded by briefly describing the bank’s own forays into digitalization and the increasing commercial importance of cyber security. Like that, the time allotted for the session quickly drew to a close. 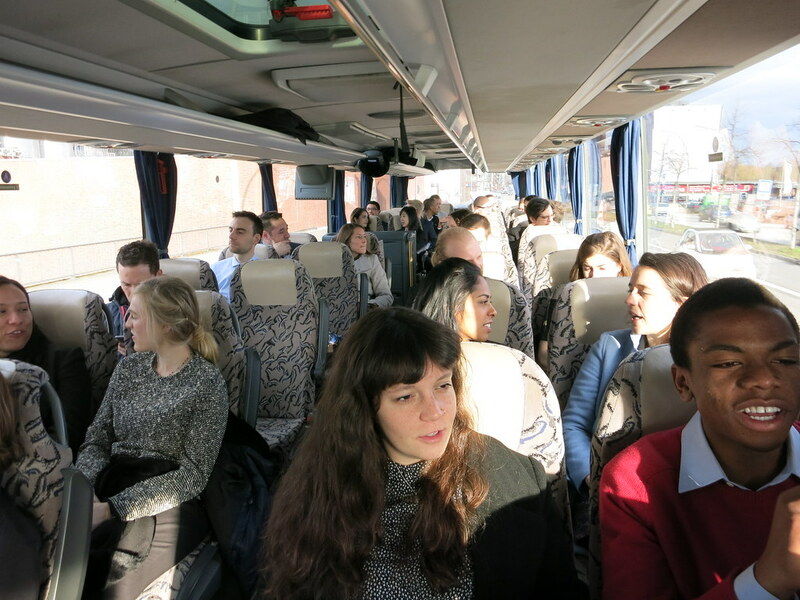 The fellows thanked their hosts for the invitation and the valuable feedback and, after having been provided with a generous packed dinner, rushed to their bus to Dresden. Michael Blank is a Ph.D. in law candidate at the University of Erlangen-Nuremberg and works for the law firm Flick Gocke Schaumburg in Berlin.